system. 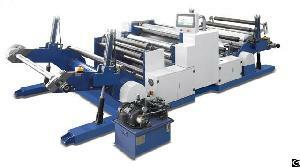 It is suitable for embossing all kinds of paper and plastic film rolls into exquisite design. It adopts automatic hydraulic lifting system, automatic heating and cooling system, frequency converter to control speed, automatic tension control system and automatic hydraulic system etc. Company Name: Iseef Enterprise Inc.